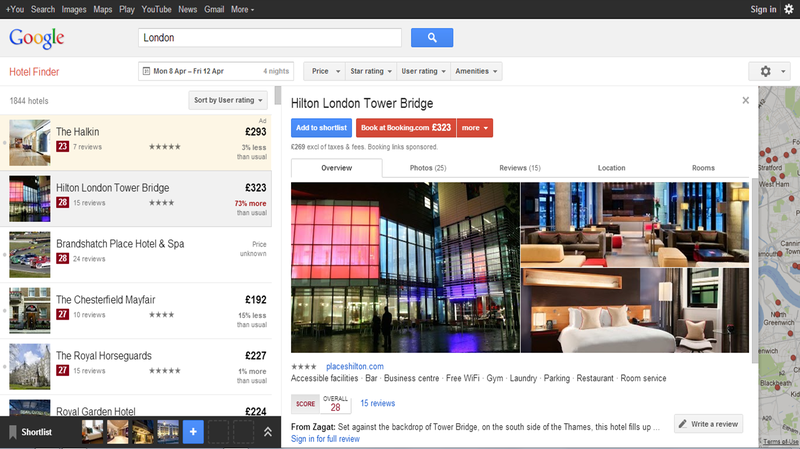 As Google Hotel Finder ramps up, what do consumers think functionally? Google Hotel Finder has been on most of our lips over the last twelve months, as we eagerly (and in some cases, nervously) await to see just how adoption of Google’s latest foray into travel goes. This week brings about Google’s next phase of the project, opening Google Hotel Finder up to other markets outside of the US. You can now visit your Google homepage and append /hotels to be taken right into the tool and start searching for hotels all over the world. Exciting move. But how will we as an industry measure the success of Google? Of course, we will look at volumes of unique visits, searches and booking conversions, but what about pure usability? What do end consumers think of the search process and is it what they have been looking for to rival the service provided by online travel agencies? Let’s take a look at the tool in more detail. So first up, we have the welcome page. A nice idea from Google, and not something you’ll find in traditional online travel websites or chain brand.com websites. Of course, it’s less needed in the later, but Google choose to start with a welcome and explanation of the tool because it’s new and because they are potentially collating a lot of results – the emphasis is on the power of their search and trying to understand travellers current search pain points. There are four boxes on the left hand side detailing how you could use the tool. Firstly, and probably the best part of the tool, is the ability to interact with the search results, displayed on a Google Map to be very specific about your hotel location draw any shaped area to automatically filter results. 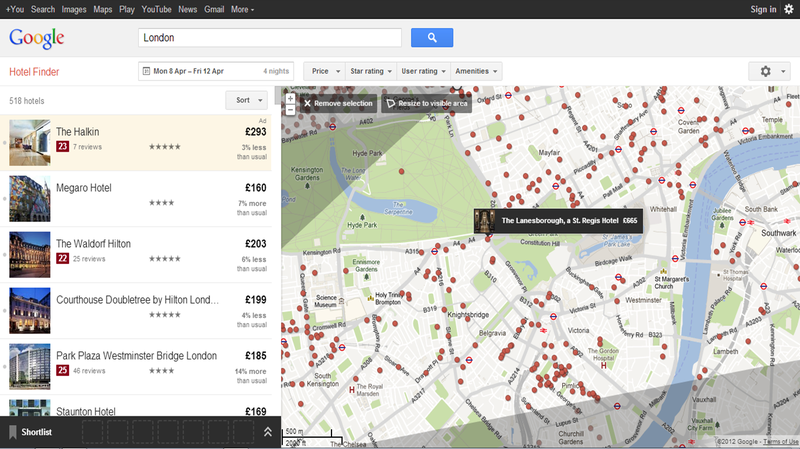 Secondly, there is a location search designed so you can look at common tourist areas. Thirdly, users are able to create a short-list of hotels, particularly useful as Google Hotel Finder will aim to return vast numbers of results and lastly, highlighting that you are able to compare hotel results to get the best value for money. For the purposes of this post, I’ve based my search on London. 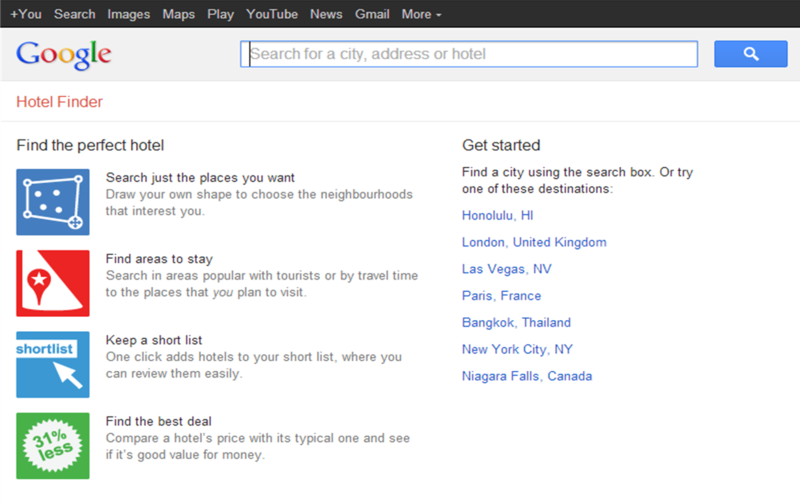 Interestingly, when I start out with Google Hotel Finder, I’m not asked for any search criteria, only my destination. This is really unusual in the online search world, but it actually works very well. Google then take me to their map display, showing pinpoints of all the hotels in the given city, with more detailed hotel descriptions and options listed in a scrollable side panel to the left. This is working on a principle that we will show the user every possibility, then given them to the chance to strip back the results to exactly what they want. First of all, you are automatically prompted to enter a date and duration on the calendar. Each time you apply a search criteria / filter, the results map and hotel listing dynamically update, and we begin to see a customised display. 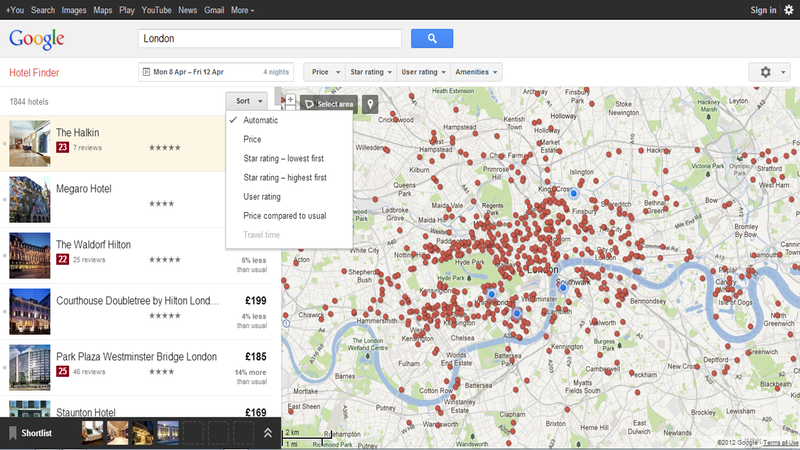 Next comes the clever bit, and my favourite feature of Google Hotel Finder. Here is the chance to set a search radius. The user is no longer governed to search in or around a or attraction, but can actually draw an area over the map results to specifically ask Google to only recommend hotels in that geographic area. You are also not restricted to use a box of circle, you can draw any shape at all to cover any area of the city you wish to view, as shown below. 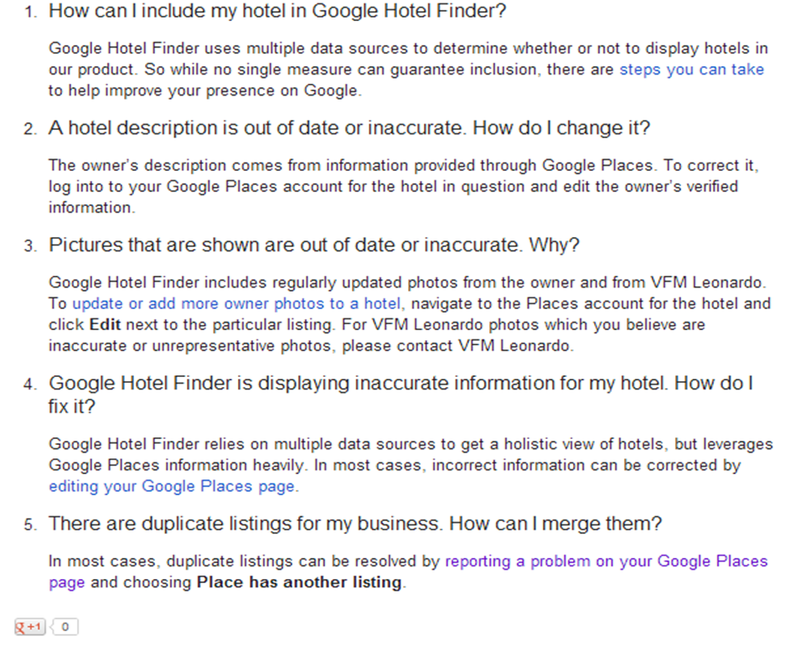 I really think this a great feature of the tool, especially for large cities that have numerous hotels. No longer does a traveller have to be price or brand lead. Sure, many OTA’s and even brand websites utilise map displays, but all tend to rely on a very generic “I want to be in New York” logic rather than being able to specify your very own, unique location demands. Next, you are able to really start homing in on your perfect hotel by applying a range of filters and criteria, from filtering results by price, star rating (both ascending and descending user rating, amenities and ‘price compared to usual’. 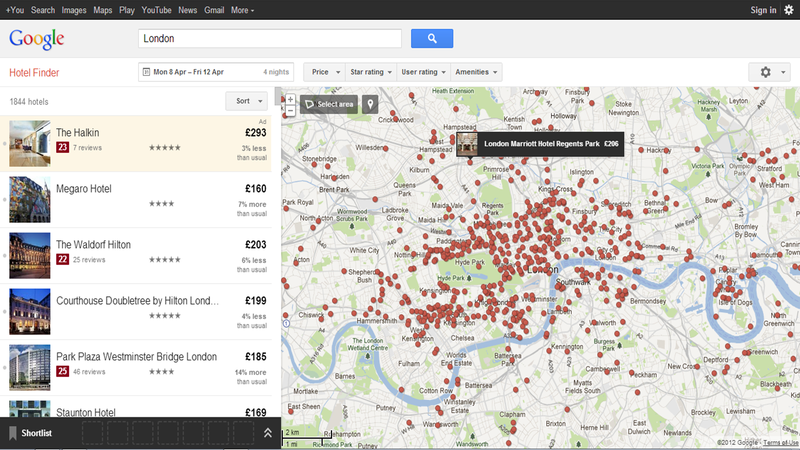 At any point in the process, you can browse for hotels via the detailed list on the left hand side. Clicking on a given hotel will replace your map display with a detailed view of the chosen hotel where you can start to look at photos, general information about the hotel and look at Google’s user-generated content. You can also start adding hotels to a favourites list so you can flick between properties you are trying to choose between. In all of my searches, when I try to book, I have no alternative to facilitate my booking with Booking.com and certainly outside the US, I’ve struggled to find over OTA’s where I’m directed to make the booking. Most hotels also have their brand.com website listed, but a lot of the independent hotels out there are missing this information, so here’s out first action point for the smaller hotels out there. In fact, a lot of people complain about multinational hotel websites (TripAdvisor springs to mind) saying they can’t get access to their own hotels content or update details. 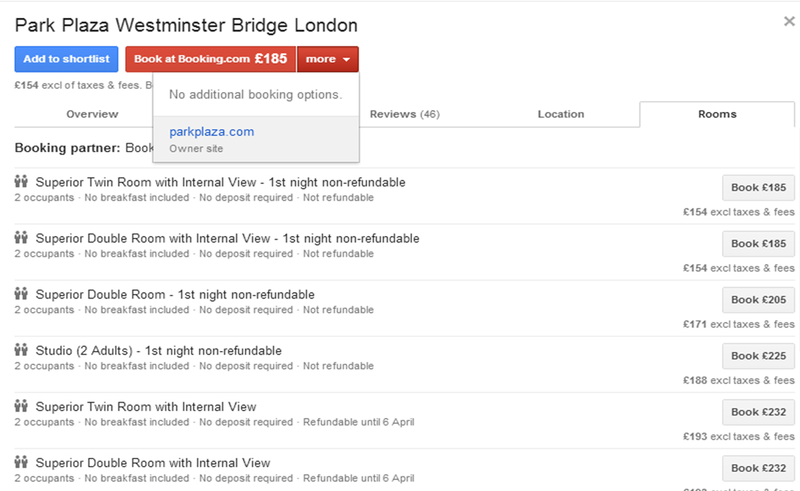 Google Hotel Finder actually make it very clear how you can do this and ways to improve and add your content – for any hoteliers reading this post, I’d really urge you to take a look at this early and make sure your details are up to date. This tool really was made for complex city searches… when I tried to plan a trip to New York, I entered the same search on Google Hotel Finder, Booking.com and Expedia – guess which was best to use? 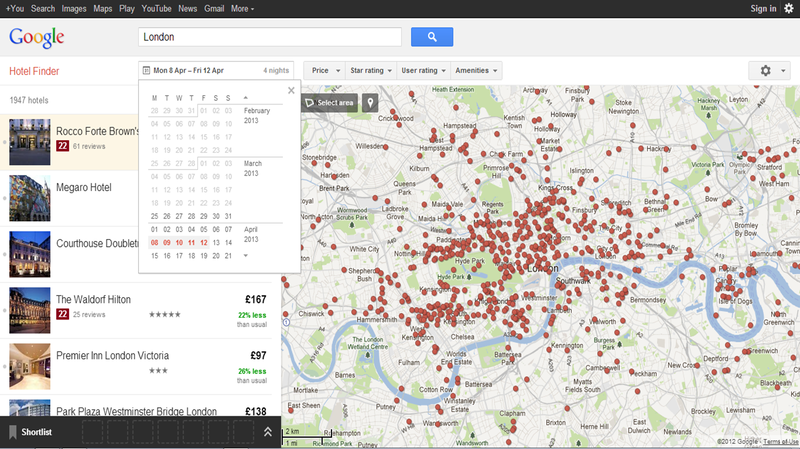 So, functionally as a search tool, I think Google Hotel Finder ticks a lot of the boxes. I’ve been very impressed with the content and usability of the website, especially the map shopping, and for this reason I think it will be a success. Quite how quickly, I’m not sure as there are lots of ‘quirks’ that need to be ironed out, but this will come in time. 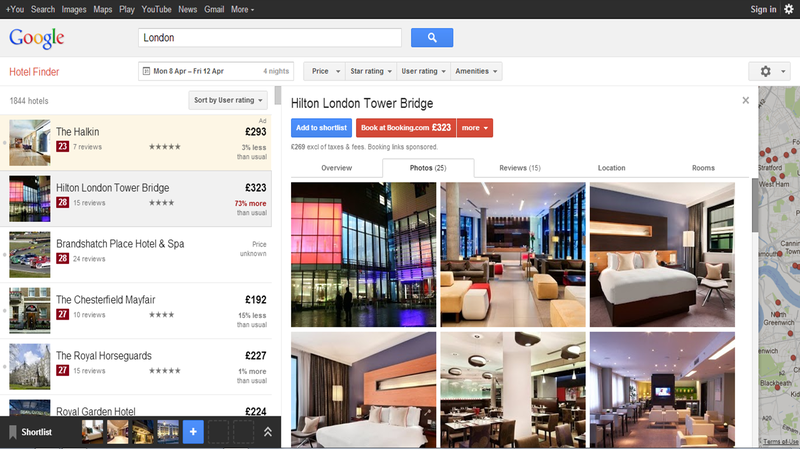 One thing’s for sure – Google want to succeed in travel and have invested heavily to do so. This is one piece of the jigsaw, and we, the hotel community would be naive to close out eyes to it. Whether we are hoteliers, working in distribution or we are online sellers of hotels, a brand new, free tool like this will have implications for us all. I include in this statement the word ‘sellers’. 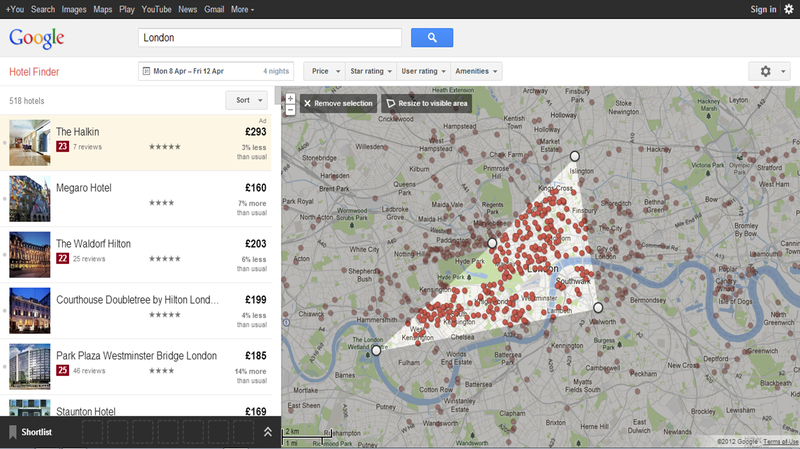 What’s to say that Travel Management Companies don’t start sourcing best available rates with Google Hotel Finder? Or high street travel agencies and hotel booking agencies? In fact, at a recent HBAA Technology conference, this notion was being explored. This tool really does have a proof point for all sectors. As such, I’ll be writing more posts on Google Hotel Finder shortly, looking at the commercial aspects of the tool and seeing how hotel chains, independents and third-party companies can, and are working with Google in this intriguing new platform. I’d love to hear what you think of the tool, the project and how you think it will impact the hospitality industry. Please do leave a comment. Thanks for listening. Clever isn’t it? What I like is that Hipmunk once again try to solve a problem that travellers trying to find hotel accommodation on numerous OTA websites struggle with time and time again – and this one’s pretty hard to get right. For those who’ve not read my previous posts, Hipmunk is an online travel website using new technologies and search approaches to offer various travel options. They created “Agony” search and sort options, claiming to ease the pain of searching for and booking flights using their rather different approach to the normal OTA formats. Similarly, and as I’ve blogged about before, Hipmunk also have an “Ecstasy” sort to find the best hotels and home rentals. 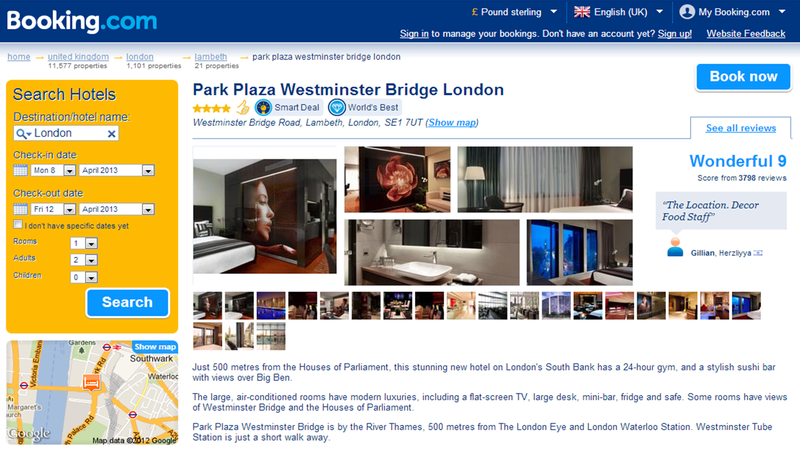 To add some context to the latest announcement, Hipmunk announced its new hotel search product which now helps match travellers to the best hotel in the ideal neighbourhood or area for their specific interests and provides detailed neighborhood guides and local information making it easier for travelers to imagine staying in a given location. Hipmunk’s new tailored hotels product will not only give travellers more context into booking their stay, it will also allow users to make their hotel reservation faster than any other competitive travel search site. Map-based Results — Hotel results are displayed on a map so users can visualize the destination and hotel options within that destination. Neighborhood Guides – Proprietary information sourced by travel writers local to the destination, which recommend the best places to stay in a given destination based on personal travel style and needs. Traveller Type Filter – Traveler type filter is incorporated into the search, allowing users to find neighborhoods best for business travel, romance (straight and gay), exploring and families. The Best Hotels — Top hotels ranked by a combination of rate, amenities, and reviews, are highlighted on maps. Options – Multiple booking options, including directly with hotels. Calendar Integration – User meeting and event locations are plotted on the map alongside hotel results in that destination, allowing users to find hotels with the best location relative to a user’s meetings. No Dates Search – Users can search for hotels within a city without entering a specific date range, allowing them to explore a destination without certain travel dates in mind. Wow, big news breaking here and I truly didn’t see this coming – and what a link-up it will make. Priceline have agreed to acquire Kayak. Priceline.com Incorporated announced today that it has signed a definitive agreement for the Priceline Group to acquire Kayak in a stock and cash transaction. Under the terms of the agreement, the transaction values Kayak at $1.8 billion. We hear that he Boards of Directors of Priceline and Kayak have unanimously approved the transaction, which is subject to customary closing conditions, including a vote of Kayak’s shareholders and regulatory approvals, and is expected to close by late 1st quarter 2013. Kayak’s current management team will continue to manage operations independently as part of the Priceline Group of companies. For those who don’t know, Kayak is a leading travel research site that allows people to easily compare hundreds of travel sites at once (metasearch) dealing with airline flights and fares, hotels and car rental. The company processes over 100 million user queries each month through its global websites and best in class mobile applications. Priceline are a leader in global online hotel reservations, with over 270,000 participating hotels worldwide. The Group is composed of four primary brands: Booking.com, priceline.com, Agoda.com and Rentalcars.com operating in over 180 countries. The Trivago webinar – What did you think? Make sure you have uploaded a main photo and match it to the season if you can! As this was the first webinar, it has been great to receive such positive feedback and I’m really looking forward to hosting our next one next month. Our next webinar will take place on Wednesday 12th December at 11am GMT and the topic will be “Managing Your Online Reputation”. Anyone wishing to attend can register free by clicking here “. If you missed the session, the full presentation can be found by clicking the image below. 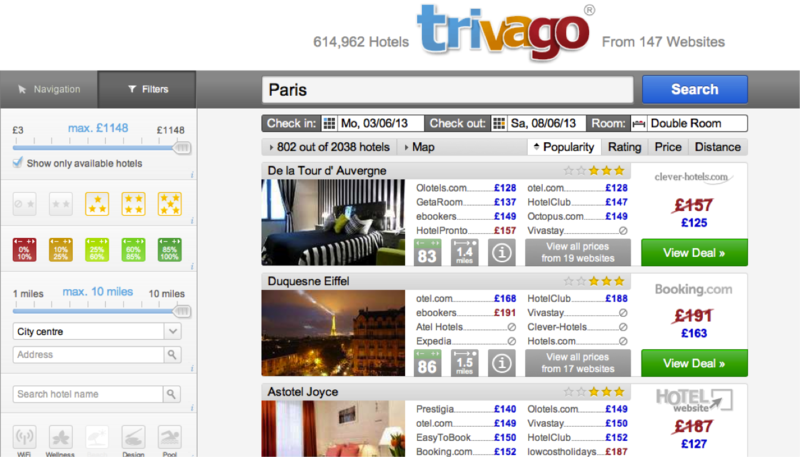 I think this is a really good initiative from Trivago to help hoteliers improve their online profile. There is still a huge amount of confusion around this topic and how you can improve what’s being displayed about your hotel. Many of these points are transparent to other OTA’s and serve as a good baseline to consider when you want to control how your being represented online. If any hoteliers reading would like to contact Trivago, they should email: hotelier-uk@trivago.com – if anyone attended the webinar, please leave a comment on this post and tell us what you thought. Did it help? What did you learn? Do share your thoughts with us. I was interested to hear that Trivago, the largest hotel price comparison and information website, will be holding a webinar for hoteliers to introduce the ‘Trivago Hotel Gateway’ and give an insight into how a hotelier can optimise their online presence. I found this particularly interesting as I’m often asked how a hotel can control, change and improve their reputation and increase bookings on OTA websites such as Trivago. Hoteliers often feel powerless to change content that OTA’s are displaying and are desperate for a way to do so more easily, so I think it’s a great idea for Trivago to start such an initiative. Put simply, the premise of this webinar is to invite hoteliers , both from small independent properties and hotel chains, to attend an online seminar to equip them with the knowledge needed to optimise their hotel’s listing on the Trivago, covering the main functions of the ‘Hotel Gateway’ portal, such as uploading new photos, writing a description of the hotel and responding to a customer review. Trivago attract over 18 million unique visitors to per month so you can see just how important it is for a hotel to ensure that they’re giving the best representation and perception of their property as possible. The webinar will also include information on the importance of having a comprehensive and up-to-date listing in order to attract customers and the importance of online reputation and how a hotelier can monitor and improve it on Trivago. Of course, this may be a Trivago initiative, but much of the information that will be given I am sure will apply to multiple OTA’s so this is a real opportunity for you to gain a greater understanding of how this part of hotel distribution works and what you can actively do to help your property shine amongst so many hotel results. This event takes place on the morning of the 7th November and you can register for free by clicking here. Over the last few years, Trivago have really grown and become one of Europe’s most well-known online travel brands. You may have seen their recent TV campaigns (show below) as the company really try and grow their name against the established names of Booking.com and Expedia. Trivago is a pure search engine – they don’t actually sell anything – in my view, they aggregate hotel content from different sources, combine the result sin a powerful search tool and they direct you to the best place to make the booking. They only show prices that hotels offer on the own websites or third part booking websites are already charging if you visited them directly, Trivago purely bring all of this together. Trivago make their money with a kind of advertising fee, and are proud to say that they do not offer any promotional space – they stay independent (a real key selling point for the travel shopper, if you ask me). Clearly the technology strategy that Trivago have in place has to be highly sophisticated – with prices changing every minute and room rates and availability varying from day to day its a tough business to be in, so I’m hoping that this webinar enlightens us a little more on how they are doing this effectively. What we do know is that Trivago’s live search tools scans over a hundred different hotel booking sites for information (prices, availability, images, reviews etc.) within seconds. Here’s the impressive stats – With close to a million searches a day, Trivago classifies, structures and compares roughly 5 billion hotel deals a day. For those who can’t attend but are interested in this initiative, Hotel Insight will be in attendance and will report the key takeaways on this blog.